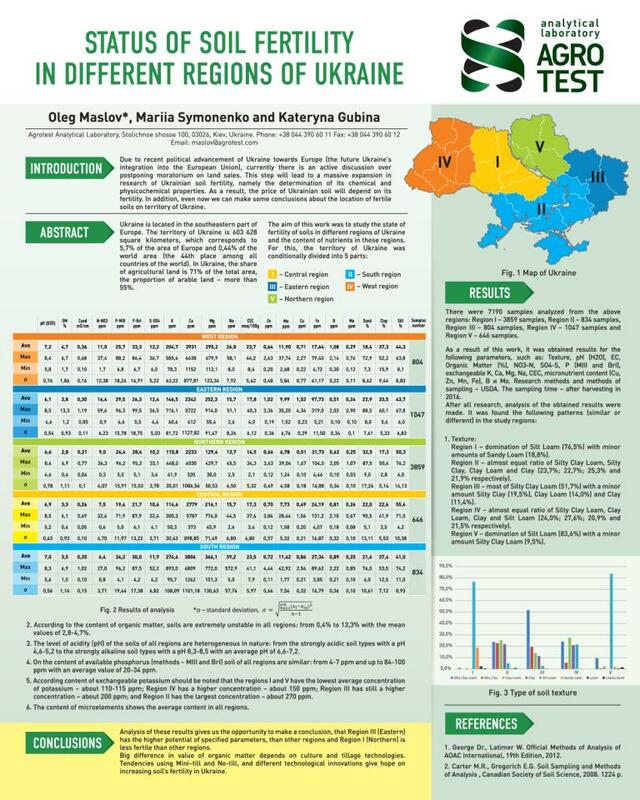 Home → News → Soil fertility condition in different regions of Ukraine. Report of the Agrotest Laboratory at the International Conference on the Analysis of Soil and Plants. Soil fertility condition in different regions of Ukraine. Report of the Agrotest Laboratory at the International Conference on the Analysis of Soil and Plants. Due to the political advancement of Ukraine to Europe (the future of Ukraine’s accession to the European Union), the issue of lifting the moratorium on land sales is being actively pursued. This step will entail a total study of the fertility of Ukrainian soils, namely the determination of its chemical and physical and chemical properties. It is clear that when deciding to lift the moratorium on land, the soil fertility will directly affect its price. Ukraine is located in the south-eastern part of Europe. The territory of Ukraine is 603 628 square kilometers, which corresponds to 5.7% of the European area and, accordingly, 0.44% of the world’s square (44th largest number among countries of the world). In Ukraine, the share of agricultural land is 71% of the total area, the share of cultivated land – more than 55%. 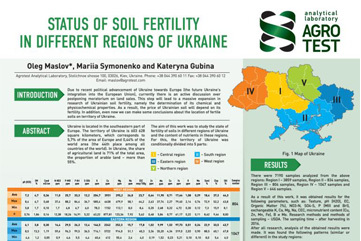 The purpose of this work was to study the soil fertility status of different regions of Ukraine and the content of nutrients in these regions. For this, the territory of Ukraine was conditionally divided into 5 parts: I – the northern region, II – the southern region, III – the eastern region, IV – the western region and V – the central region. A total of 7190 samples from the abovementioned regions were analyzed: Region I – 3859 samples, Region II – 834 samples, Region III – 804 samples, Region IV – 1047 samples and Region V – 646 samples. As a result of this work, results were obtained for the following parameters such as: texture, pH (H2O), EC, organic matter (%), NO3-N, SO4-S, P (MIII and BrI), exchangeable K, Ca, Mg , Na, ECO, the content of nutrient trace elements (Cu, Zn, Mn, Fe), B and Mo. Methods of research and sampling – USDA. Time range of sampling – after picking up 2016. 2. According to the Organic Substance Content, the soil of all regions is extremely unstable: from 0.4 to 13.3% with an average value of 2.8-4.7%. 5. According to the content of exchangeable potassium, it should be noted that regions I and V have the lowest average potassium concentrations – about 110-115 ppm; Region IV has a higher concentration of about 150 ppm; Region III has an even higher concentration of about 200 ppm; and region II has the highest concentration – about 270 ppm. 6. The content of trace elements speaks of a fullf the overall average content in all regions. The analysis of the results gives grounds for making certain conclusions about the specified parameters of the research, as well as on the fertility of each of the regions for the specified parameters. Trends in the transition to new technologies gives hope for improving the soil fertility in Ukraine.